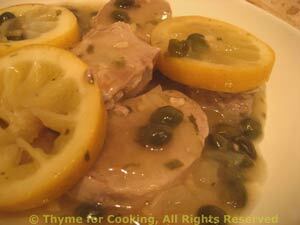 Pork Tenderloin with Lemon and Capers, easy mid-week dinner. This dinner has a Lemon theme complimenting the flavors of each dish. We're using the first herbs of spring from the garden - if you're lucky enough to have them coming up. 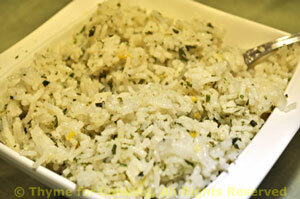 The lemon and herbs combine to make a very refreshing, light rice side dish. Only use the mint if it's fresh, dry is too strong. If you don't have fresh mint use thyme. Snip mint and chives with sharp scissors if using fresh. Using a lemon zester or grater, make 1 tsp lemon zest; set aside. Add rice, sauté, stirring, for 1 minute. Add stock and dried herbs. Squeeze the juice from 1/2 lemon and add to the rice (mind the pips). Cover and cook for 15 - 20 minutes (or length of time on package). When rice is almost finished, stir in fresh herbs and lemon zest. Olive oil and lemon make a fresh-tasting finish to vegetables, almost like a light vinaigrette. Finish with lots of black pepper if you like. 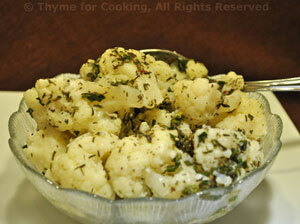 Cut cauliflower into pieces, put into a steamer basket and steam over water for 15 - 20 minutes until fork-tender. Heat oil in the same pan. Heat through and add cauliflower. Toss to coat and serve.